These last 3 weeks, I've continued to train for my 10k. I've been slowly adding mileage and intensity to my training weeks, trying to peak for a July 4th 10k. I've run 100 miles so far this training cycle with over 12,000 cumulative elevation gain. I've been running mostly on trails with some elevation, so it'll be interesting how that translates to a street race. I'm going to try to incorporate a little move pavement work in the next couple of weeks before the 10k. At the same time, I've got my eyes set on my next goal race, which is the Iron Horse Half Marathon in Midway, KY, in October. I had a great run there in 2016 and I'm hoping to get a PR there this year since I'm more familiar with the course now. I've settled on a training plan. I'm going to start the Hansons beginner Half Marathon plan. This is a pretty aggressive plan. If you're not familiar with Hansons, they have some pretty good books that explain their philosophy. Basically, it's run. A lot. You get tired. Your legs get tired. And still you run. A lot. The beginner plan has 6 runs a week, with 3 SOS (Something of Substance) workouts a week. Tempo runs, Long Runs, and Speed or Strength Interval runs. The plan starts with Speed workouts and switches to Strength workouts for the last half of the plan. Each run is to be run at a prescribed pace. Tempo runs are run at goal race pace. My goal pace is 11:49/mi. Long runs are 12:50/mi - 14:20/mi. Easy miles are 13:20/mi - 14:20/mi. Speed intervals will be run at my 5k pace (10:53/mi) and Strength intervals at my 10k pace (12:00/mi). I began investigating Hansons last year in preparation for my 2nd marathon. But I decided running 6 days a week and running a lot of miles was a recipe for injury for me at that time. I spent several months and 2 training cycles (one for a half, the other for a full) slowly building up my tolerance for running more than 3 days a week. In the peak training weeks for my marathon, I was running just over 40 miles a week. A lot for me. 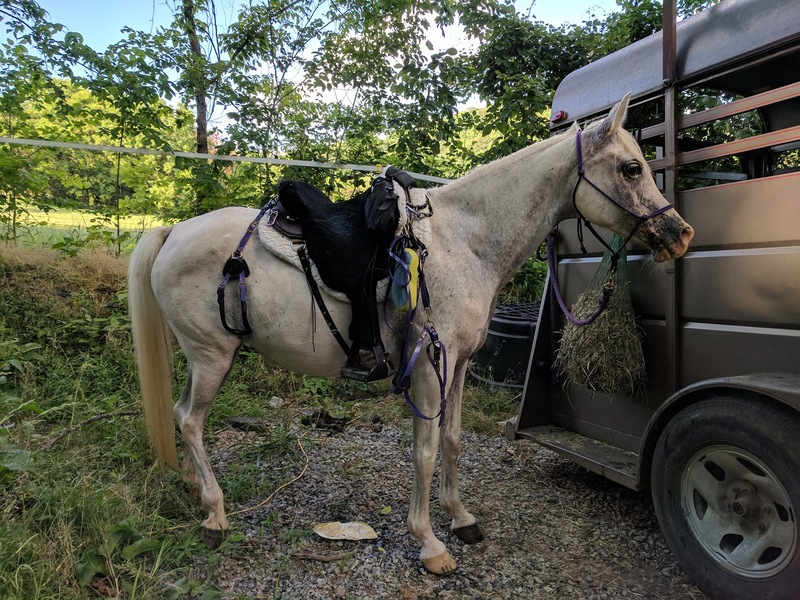 My endurance horse after a hot training ride. I plan to run at least 5 days a week. 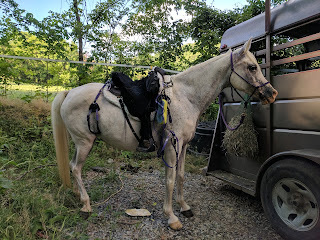 I will try to run 6 if I can, but I also have my endurance horse to condition, so Sundays will be for her long ride. If I don't ride Sasha or I happen to have time for the easy run, I'll throw that run back into the mix. I've purposefully shifted and swapped the days of the training plan so Sundays are always easy miles. I will always have an easy day or rest day between my SOS (Something of Substance) workouts. Saturdays are rest days for me, except in very rare cases where I'll run on Saturday night after sundown. I'm a Seventh-day Adventist and Sabbaths are rest days, both for mind and body. So that leaves Monday through Friday for my runs. Mondays will be Tempo workouts. Wednesday = Long Run. And Friday for Speed/Strength workouts. 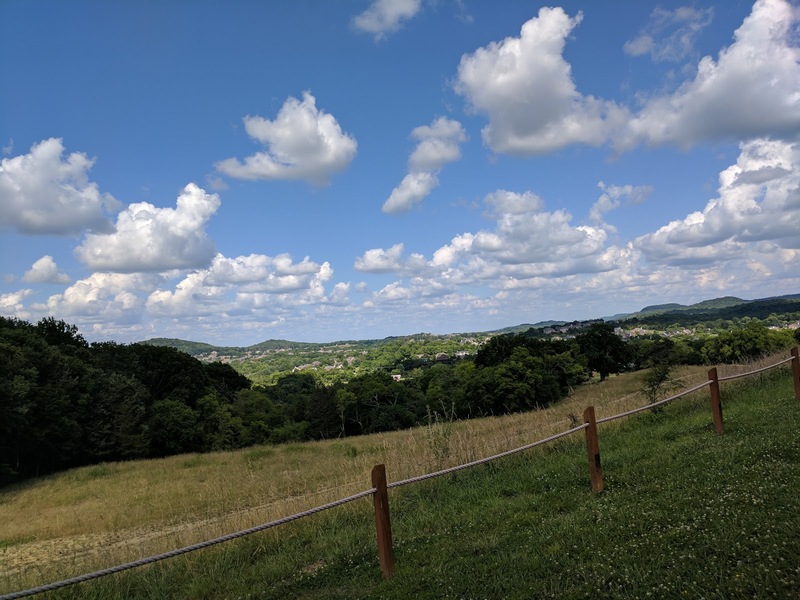 View at Smith Park, one of my training trails. More alterations! Since I'm looking at doing a trail marathon after this half marathon, I'm going to run some of my half marathon training runs on trail. I plan to do most of my easy miles on trail and at least some of my long run miles on trail. Because of this, my easy and long miles will be slower than my prescribed paces, but overall, I'm expecting the effort and the overall benefits of trail running to win out here. Tempo and speed/strength interval runs will be on pavement to keep my legs used to the pounding of the road. The Hansons Half Marathon training plan is 18 weeks. So technically, I started this plan this week. Fortunately for me, the plan eases into the miles, so while I'm tapering for my 10k, I'm ramping up for the half marathon training. This week was a little weird in that I did 3 interval workouts for 10k training and one easy run instead of the 4 easy runs prescribed by the Hansons plan. But the next two weeks are fairly similar since my 10k plan has me doing mostly easy miles between now and the 10k with the exception of a couple of easy interval workouts and a negative split run. None of which will negatively affect the ramp up of the half marathon plan. This Bluetooth headset is still pretty much useless. The Android app did get an update, but I'm still having crashes both with the headset itself and the app. Not pretty. I'm a little scared to trust the thing for runs because I want to make sure I have my podcasts or music when I want them. The Vi has definitely not lived up to the hype for me.